When I first got diagnosed with SIBO, my practitioner put me on the extremely restrictive Low FODMAP/SCD combination that seems to be the go to protocol by many in the SIBO community. I was on the diet for about 4 months in conjunction with herbal and antibiotic treatment. Although I was following the diet to a tee, my health continued to deteriorate. I struggled to maintain my weight, my gut symptoms were even worse than before and my hormones were cray cray. I was so afraid to feed the beast that I failed to properly feed myself. 1. Dysbiosis in the large intestine. These diets starve all your gut bacteria, not just the bacteria in the small intestine. The low FODMAP diet has been shown to reduce symptoms of IBS, but they have also been shown to significantly reduce Bifidobacterium and the total microbiota in GI tract. Interestingly enough, one study found that people with IBS had a 2-fold reduction in bifidobacteria compared to healthy controls. This leads me to wonder….if low bifidobacteria is associated with gut dysfunction, is a diet that further reduces these good bugs a good option for SIBO? Bifidobacteria, like Lactobacillus, are essential for a healthy microbiome. They have been shown to increase transit time, promote short chain fatty acid production, protect the gut lining, increase immunity, prevent GI infections and even help in the production of bile acids. Without a healthy bifido population, SIBO will be impossible to overcome. When we feed our good bacteria, they produce short chain fatty acids like butyrate, acetate and propionate. Butyrate is the preferred fuel for the cells lining the GI tract and increases immune function in the GI tract. Acetate and proprionate improve motility and reduce inflammation. Low levels of these acids are associated with autoimmunity and systemic inflammation. Chris Kresser also adds some valuable insights to this discussion. He says that many of his low carb patients that eat less than 50g of carbs a day have alkaline stool with many low SCFAs, low diversity and other markers of dysbiosis. Jeff Leach completely supports this stance, he writes “whether you draw that line at 25, 50, or 75g a day of carbs, its low I’m afraid from the perspective of your gut bugs. Especially if those carbs contain a limited amount of resistant starch and other dietary fibers – food for gut bacteria.” Most SIBO diets seem to meet the low fiber and low carb criteria that Leach warns against. It’s not just the reduction in fiber in these diets that can be problematic, but the reduction in variety can also lead to dysbiosis. Different bacteria like different fibers. When you restrict your diet to 5 types of plants foods, you run the risk of overfeeding one bacteria and starving others, which leads to microbial imbalances. I was able to see the unfortunate shifts from a low fermentation diet in my own gut bacteria with my pre and post treatment stool test results. I had no pathogenic bacteria before my treatment, but after months of fiber restriction and herbals, I had developed a massive overgrowth of a pathogenic bacteria called Proteus Vulgaris. Not to mention, my lactobacillus population fell sharply and my diversity was very low. Although low fermentation diets may alleviate symptoms, they can be damaging in the long term health of your colonic bacteria. As I discussed in my probiotics post, a balanced large intestine is essential for a healthy functioning small intestine. So, we cannot treat SIBO through a singular lens that only focuses on the small intestine. The large intestine bacteria play a pivotal role in restoring motility and function. 2. You need to feed the beast in order to take down SIBO. Dr. Pimental, a leader in SIBO research, has said that “happy and well fed bacteria are more sensitive to antibiotics and easier to kill.” He recommends his patients eat plenty of fermentable foods during treatment to keep them active so that the antibiotics can effectively wipe those bad bugs out! Kelsey Marksteiner, a dietician that specializes in digestive health, recommends that her clients undergoing SIBO treatment eat as many FODMAPs as they can tolerate and at the very least 100g of carbs a day. As far as what the best diet is after treatment, she writes “in my eyes, that’s the million dollar question right now and it’s a question we don’t have the answer to quite yet.” Until that question gets a clearer answer, she recommends her clients eat a whole foods diet and to avoid foods that cause symptoms. Based on these insights, prebiotic foods should be seen as powerful tools in helping to eradicate the overgrowth. During pharmaceutical or herbal antibiotics, (in my opinion) you should eat all the prebiotic and high FODMAP foods that you can tolerate. Although, I don’t think this warrants a junk food bingefest that many SIBO sufferers indulge in while they are on antibiotics. Junk food, while tasty, can induce intestinal permeability and inflammation that is preventative to healing. But, luckily there are plenty of nutritious and tasty whole food FODMAPs that you can eat instead! Onions, garlic and apples oh my! 3. These limited diets are a recipe for nutrient deficiencies. When you are on a really restrictive diet and eliminating foods that you may tolerate just fine, your diet is at high risk of developing nutrient deficiencies. Nutrient deficiencies can effect virtually every aspect of health. And when you are battling SIBO, nutrient deficiencies become even more problematic. In a recent webinar, Kiran Krishnan, a Microbiologist specializing in the microbiome, discussed how really restrictive diets can disrupt the healthy function of the immune system in the gut by reducing the secretory IgA in the gut mucosa. Secretory IgA is an antibody found in the mucous layer above the gut lining that serves as the first line of defense in protecting us from toxins and pathogenic microorganisms that we consume. It is important to remember that food, bacteria and toxins have to absorb through the gut lining in order to truly enter the body. IgA neutralizes any threats in the mucous on top of the gut lining in order to prevent entry into the body. In terms of SIBO, IgA is essential for fighting off and preventing overgrowths of bacteria in the small intestine. When IgA becomes low, bacteria, toxins and food will bypass the mucosa causing an immune response which creates an inflammatory cascade in the body. The immune cells in the gut lining essentially think they are under attack and this chronic over stimulation of our immune system can lead to both immune and gut barrier dysfunction. So, when levels of IgA are low, your immune system won’t be able to remove unwanted pathogens and your gut will be inflamed preventing SIBO recovery. Krishnan says that when individuals with gut issues and food sensitivities limit the diversity of their diet, their secretory IgA usually declines. He attributes this mostly to nutrient deficiencies that ensue from a restricted diet. Zinc, vitamin C, selenium, choline, glutamine, glycine and omega 3 fatty acids are key nutrients for IgA formation. Based on the restrictive diets that I have observed in various online SIBO groups, I think many SIBO suffers are at higher risk of Vitamin C deficiencies since they avoid fruit and many cruciferous vegetables that are high in C. If your diet is limiting in foods that provide the nutrients necessary for IgA, you may consider broadening your diet or supplementing accordingly. Krishnan also mentions that diversity in the large intestine is also associated with higher levels of IgA. So eating chicken, carrots and zucchini at every meal is going to result in lower microbial diversity and lower IgA. Eating as diverse a diet as possible while treating SIBO is therefore going to be important in maintaining healthy IgA levels. The important immunological barrier that Dr. Sonnenburg is referring to is the gut lining. Above this gut lining, is a mucous layer that serves as a protective buffer preventing direct contact of the epithelial lining with bacteria and toxins. This mucosa also serves as a habitat and food source for our colonic bacteria. When your mucous layer is thin, bacteria and toxins will come into contact with the epithelial lining and elicit the same inflammatory immune response that occurs from low IgA. The goblet cells within the gut lining produce mucins, which are the building blocks of the mucous layer. The primary fuel source for these goblet cells are the short chain fatty acids that are the product of intestinal bacteria fermenting fiber. So, when you don’t eat fiber, your goblet cells can’t produce enough mucous. Without fiber and mucous, the bacteria become ravenous, eating through all the mucosa and they will eventually start consuming your gut lining. This degradation of the gut barrier will not only lead to gut dysfunction, but system wide inflammation. SIBO suffers, myself included, are guilty of demonizing fiber to such an extent that we lose sight of how important it is to the overall health of our digestive system. We must not fear fiber. Fiber helps keep a mucous rich digestive tract ensuring a strong gut barrier. 5. It is very easy to under eat and maintain a healthy weight. When you are following a strict low carb low fermentation SIBO diet, it becomes much more difficult to consume the right amount of calories. I am not saying that it can’t be done, but I think the restrictions lead many to under eat. I become alarmed when I read post after post from SIBO sufferers on Facebook who are struggling to keep weight on and are continuing to drop more foods from their diet. I personally lost 15 pounds in the first 2 months of being on the low FODMAP/SCD combo, which contributed to my low energy levels and hormone dysfunction. With a considerable amount of effort and tweaking, I was able to add more fats to maintain my weight for the remaining months that I was on the restricted diet. I think there are 3 main reasons people tend to under eat on these diets. First, most people don’t increase their fat intake to compensate for the decrease in carbohydrate intake. You need to eat multiple tablespoons of fat at each meal in order to maintain your weight on these types of diets. And, when you are switching from a more balanced higher carb diet, it can be difficult to grasp the boat loads of fat you will actually need to maintain your weight. Second, when you are so limited, nothing sounds appetizing and you just don’t eat. I experienced this first hand when I was eating the same 10 foods on a regular basis. Eating became a chore. Third, eating a high fat/high protein diet can cause hormonal shifts that reduce appetite, creating a vicious cycle of undereating that is hard to overcome. A high fat or high protein meal that is typical of a SIBO diet can trigger the release of the hormone cholecystokinin into the small intestine. This hormone sends signals to the brain that produce a sense of fullness and satiety. This fullness can cause problems because your appetite doesn’t match your calorie needs. I was never hungry while eating the high fat and high protein meals, which led me to under eat. The consequences of chronic undereating are vast, but perhaps the most detrimental consequence (in terms of SIBO) is the rise in the stress hormone cortisol. Essentially cortisol activates your sympathetic nervous system and your “fight or flight” response. Your body can not properly digest and absorb food when you are in this “flight or fight” mode. Instead, your parasympathetic nervous system needs to be activated in order for you to enter into “rest and digest” mode. With this rest and digest mode disrupted, high cortisol can slow digestion and increase inflammation in the GI tract both of which will hamper recovery. I am hoping to go into detail about the stress gut connection at some point in the future so stay tuned, but if you want to learn more info now I highly recommend this podcast episode of the Ancestral RDs podcast. It is crucial that whatever diet you choose to adopt, that you can do so without starving yourself. The first priority of any diet should be to provide enough calories to maintain a healthy weight. Starving your gut bugs should always take a back seat if you are struggling to keep the pounds on. Plus, the restrictions can lead people to social isolation, because they don’t want to go out to eat with friends or go to parties with foods they cannot eat. This isolation can (in my opinion) be just as detrimental to a person’s recovery as eating a food on the naughty list. A better solution would be to adopt a diet that you know you can maintain that will allow you to minimize symptoms without stressing you out or hindering all of your social interactions. 7. Many low carb SIBO diets totally disrupt thyroid function. Many SIBO experts seem to preach that the lower the carb intake the better when dealing with SIBO. Usually this leads to a severe restriction of starches and fruits and the adoption of a more fat based diet. A long term adoption of a low carb diet can lead to thyroid dysfunction. Insulin is needed in order to convert T4, the inactive thyroid hormone, into T3, the active thyroid hormone. If you adopt a ketogenic (very low carb diet) diet, your insulin production will be low and your conversion of T4 to T3 could be negatively affected. The low levels of T3 will present with all the unfortunate symptoms of hypothyroidism. As I discussed in my last post, thyroid hormones are essential for the gut motility and immunity in the GI tract. If your diet is inducing low T3 production, then your motility will slow and exacerbate your SIBO symptoms. When you eliminate starches and many fruits, it can be very hard to get enough carbohydrates to maintain proper thyroid function. I have seen many experts recommend that SIBO patients should stay below 50g of carbs a day. In my opinion, this level of carb restriction is unnecessary and can be detrimental to your hormones if maintained for long periods of time. So, what diet is right for SIBO? I don’t have a clear answer, but I think removing any food that could potentially feed the bacteria will create more problems than it will solve. I think a short term low FODMAP or fermentation diet may be helpful during the initial phases of eradication and healing, but reintroducing fermentable fibers in the diet becomes crucial for reestablishing balance further downstream in the large intestine to correct the root of the SIBO problem. Finding the optimal diet for SIBO treatment and prevention should be determined on a case by case basis. You should not be afraid to experiment to find the right diet for you! It wasn’t until I broke free from the constraints of the expert endorsed SIBO diet that I began to make improvements. Embrace a whole foods diet. Remove all the processed foods and stick to fruits, vegetables, healthy fats and grass fed protein. Limiting pesticide exposure by purchasing mostly organic is also important since pesticides can create more inflammation in the gut. Limit dairy to hard cheeses, yogurts and kefir. Non-fermented dairy products are higher in lactose which is a sugar that is hard to break down in our GI tract and can exacerbate SIBO. Pinpoint your trigger foods. Everyone with SIBO has certain foods that they are very sensitive to and removing those items for longer periods of time while healing can be helpful. But, don’t be afraid to reintroduce them in the future! Trust your body. You shouldn’t base your food choices on an arbitrary list of no and yes foods. Most people have certain FODMAPs that they react to, but they do fine with others. Have the confidence that you know what foods work best for your body and don’t let anyone convince you otherwise! Reintroduce foods slowly. Allowing your body to adjust to foods you haven’t eaten in a while can make the transition to a broader diet much more comfortable. A few bites of a formerly forbidden food can be a good place to start. If you tolerate that, then you can add a few more bites the next time you eat it. Consider the large intestine implications of your diet choice. Don’t focus only on what’s happening in your small intestine and think how your diet will affect the overall landscape of your digestive system. Don’t focus your treatment solely on diet. No diet will fix the root cause of your SIBO. You are much better off choosing a more relaxed diet that you can comfortably maintain and turning your focus primarily on fixing the mechanisms that could be causing your SIBO like thyroid dysfunction, impaired MMC function, stress, colonic dysbiosis and other potential root causes. Work with a practitioner. Sometimes you may need some help from a SIBO specific practitioner to determine the best diet for you. If you feel lost and totally overwhelmed with figuring out what the heck you should be eating, consider booking a free 20 minute consult to see if I may be able to help! Previous Previous post: How ignoring your thyroid could be derailing your SIBO recovery…. Next Next post: Antibiotics for SIBO….Helpful or Harmful? I was wondering if the limited calories is OK for someone who is overweight. Also, you didn’t mention the use of probiotics. Wouldn’t they help repopulate the intestines with good bacteria? Where can I get a copy of this blog..I want to have this to refer to. It is exellent! Is there a way to subscribe to your blog? Hi Andrea! Yes, You can enter your email on the right side bar of my page. Let me know if you can’t see it and I will screen shot a pic for you to reference. Well I guess it makes sense but not easier!!! I think your right in that it def creates more stress. I will be keeping a food dairy for now and see what foods cause the most grief. I know onion and garlic are very big offenders!!! Happy to keep eating my sweet pot and avo though will cut the portion down. I had been eating about two avos a day!!! I am also on AIP diet so already limited in what I was eating. Going to be brave tho and start introducing more foods!!!! Thanks great article. Looking forward to hearing other peoples response! SCD was never meant to be low carb, but I can see how combining SCD with Low Fodmap restrictions would create very limited food choices. Yes, you are correct. I don’t think SCD and low FODMAP are meant to be low carbohydrate, but I think both the strong fear of carbs among SIBO sufferers plus the restrictive nature of various diet combinations can make it very easy to consume too little carbs. Thanks for the response! Hi Amy- what if FODMAPS and certain foods cause unbearable bloating and histamine reactions? I think if certain FODMAPS cause horrible symptoms than avoiding them is probably a good move, but shouldn’t be a long term solution. I think avoiding FODMAPS for a month in combination with other treatment strategies can be helpful. But, slowly adding them back in should always be a part of the long term treatment plan. Pingback: SIBO & the magic of oregano oil | ..when ponie's grow into unicorns.. Brilliant!!!! Couldn’t agree more. I am constantly experimenting but do agree that limiting variety long term does not eliminate symptoms and may encourage others….Thank you for sharing this!! I just messaged you but wanted to post my question here as well. i realize how critical fibers and carbs are for microbial diversity, but what if they cause unbearable bloat? right now even a pinch of any type of prebiotic fiber or fodmap gives me unbearable bloat. Hi Russell, I think this is where working with a practitioner to figure out a strategy of when and how to add in more prebiotic fibers and fodmaps. Best of luck! Thank you so much for this post. The first 2 times I went through SIBO treatment I was so scared and ate such a limited diet that I was an emotional mess, I cried at parties as I felt I could not relax for fear I was eating something I shouldn’t, I had guilt every time I had a symptom thinking it was my fault for not being strict with my diet, I lost a lot of weight quickly, and my symptoms did not improve all that much. I was also told by 2 practitioners to stay on the diet for the rest of my life. It wasn’t until I started eating a better variety of foods that I started feeling better. I still have a mild case and am going through treatment again while on the SCD diet but only for 1 month. I also wonder if I should be on a diet at all since my symptoms are so mild that they don’t bother me much and rarely. Thank you for sharing your experience Michelle! I personally feel like symptoms should really be the best gauge on what to avoid and what not to. I think eating a wide-variety of whole foods should be the goal! Paying attention to how I feel and react to foods is really how I decide on what to eat! Oh my goodness you are a rock star Amy. 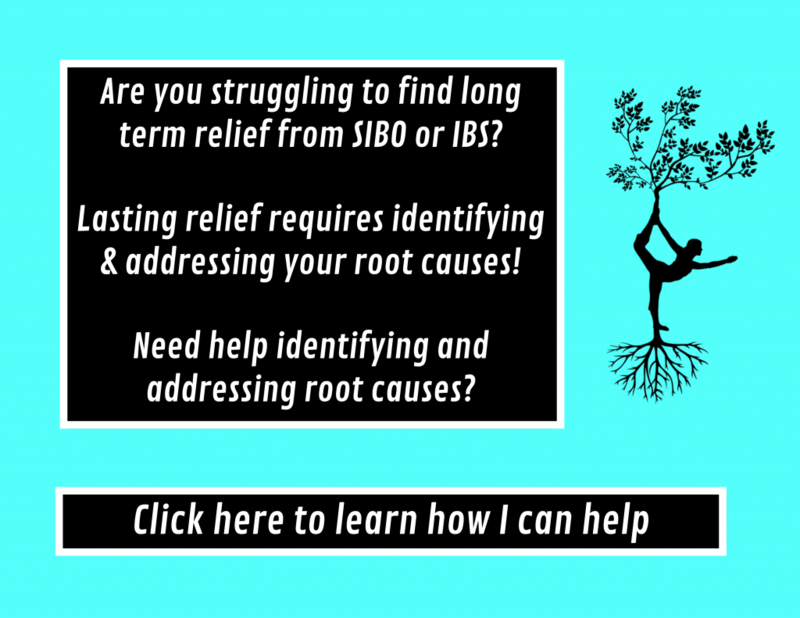 Can I continue to share on the SIBO site? Hahaha yes share away! Thanks for reading Donna! I loved every word of this, I just don’t know how to put it into practice without relapsing. I will have a negative breath test, feel great, slowly add in some variety, continue to feel great & gain needed weight for ~6-9 months, and then all of a sudden feel terrible all of the time – not connected to what I am eating, and when I repeat the breath test will be crazy high/show severe overgrowth. That makes it very hard to go back to experimenting with a more varied diet when this happens over and over. I’ve been at it 6 years. I am currently SCD + low FODMAP which I know is way too limiting long term! Hi there! I am so sorry to hear you are struggling with relapse! I think that is probably a good indicator that your MMC is impaired. Focusing on strengthening your MMC signaling may be your best bet! Thanks for reading! I agree 1000% again! You outlined my thoughts on this topic beautifully! This will be another one I send to patients. Hahaha I am glad we are on the same page yet again! Great minds think alike! Thank you for sharing all of this information. When I was diagnosed last year I tried the SIBO specific diet, but just couldn’t stick with it due to how restrictive it was. My ND suggested I just eat what I could regardless of high or low FODMAP. Now however, I feel more restricted than ever as soooo many of the foods on the high side bother my stomach, as do fermented foods. I don’t even know where to go from here, and I often feel like this will never be resolved. I’m just curious if you have beaten this yourself? Hi Erin! I have total been where you are at. It can be incredibly frustrating and confusing when every food seems to make you feel like a bloated hot mess! But, I think usually if you are having a ton of symptoms to tons of foods, there is usually something that still needs to be addressed (such as large intestinal issues like yeast, parasites or bacterial pathogens, low stomach acid, brain-gut issues, gut inflammation etc.). Once some of the root causes are resolved, eating more FODMAPS is usually much better tolerated. I don’t have SIBO anymore and I can tolerate onions, garlic and all the high FODMAP foods! So, there is hope! Hang in there and keep digging! I see a lot of good sense in this post, and I wish I could follow your example. I am currently following the SIBO Specific Diet, which is extremely limiting because it includes ONLY foods that are both low FODMAP AND “legal” on the Specific Carbohydrate Diet. I have been on this diet for two months. I have found over and over, through experimentation, that consuming any more than tiny amounts of carbohydrates other than naturally occurring glucose means that I will pay for it with hours of pain the next day (two full days of pain for starchy carbs). I’ve actually gotten so that I can tell what carb I’ve eaten by what kind of pain I experience the next day. Dextrose feels like Pop Rocks candy exploding inside of me, while starch is like trying to digest a heavy block of cement. I’m finally on herbal antibiotics now, so I’m hoping I can expand my diet soon. In the meantime, I have no choice but to follow the SIBO Spefic Diet unless I want to be in constant pain and call in sick to work almost every day. Am I an extreme example, or have you heard similar stories from other SIBO sufferers? Hi Kristina! Thanks for sharing your experience. There are definitely a subset of SIBO sufferers that are very intolerant to carbs. I tend to think that restrictions should be based off symptom relief, so if you need to remove carbs at the moment to feel symptom relief than by all means do that. But, I think having a reintroduction plan in place so that your diet isn’t too restrictive for too long is probably a good idea. I would say that you should be able to tolerate carbs much better once your SIBO is cleared by the herbal protocol. Listen to what works best for your body, but don’t be afraid to add stuff in as you progress through treatment. In my opinion, the extreme carb intolerance you describe indicates that the SIBO is still very active and needs to die down before you can tolerate carbs. I hope you start feeling better and can liberalize your diet in the near future!! Thanks for reading!! Hi Amy, I thought I’d give you an update. I took oil of oregano for six weeks, and it improved things enough that dextrose — but only dextrose — no longer caused pain. All other carbs still did. I tried to add allicin, but I couldn’t tolerate it (read: it chained me to the toilet). Near the end of November, I finally got prescriptions for rifaximin and erythromycin. Within five days of starting them, I could eat a bowl of chocolate ice cream with no pain. Several month later, I’m doing well. I still can’t eat most whole grains or legumes, but sucrose, fructose, lactose, and fructans are okay, as are potatoes, white rice, oats, field corn (in the form of nacho chips and tortilla shells), and small amounts of white bread. Honestly, the abx were like a miracle. I hope to get whole grains and legumes back someday, but if I don’t, well, I can live with that. I completely agree that diets are best used for symptom relief. I was on the SIBO Specific Diet for five months (that’s how long it took to get a prescription). That’s really too long to stay on it, but I had no choice. It was either that or spend my days bedridden and missing more work. I’m now eating whatever doesn’t hurt — I’m sort of paleo with potatoes, rice, field corn, and oats added. Hi Kristina! Thanks for the update! So happy to hear that you are doing much better after the antibiotics and have been able to incorporate more foods. Hopefully after a little time for your gut to adjust you can add in some additional legumes, but only time will tell. I actually do much better with sprouted legumes and grains. I also think you are right that staying on SCD for too long can be problematic. I learned that the hard way too. I hope that through sharing our stories we can help some people avoid being too restrictive! Thanks for reading and sharing! Brilliant article. I am reading this but applying it to the low starch diet which I have tried (with no success) to ‘starve’ klebsiella bacteria in the colon. I’ve already changed what I’m doing by eating more and a greater range of vegetables and fruits, (and my symptoms are no worse if anything better) but this confirms I’m doing the right thing. I think the restrictive diet had its place when I did a few months of ‘bug killing’. Thanks for reading!! I think you are right that restrictive diets have there place when you need some symptom relief, but in the long run they can cause some issues! Glad you have been able to add in more foods! Fabulously helpful post, thanks so much! This explains so much. Restricting the number of foods I eat helps for a few days, but after that I have even more problems. Any thoughts on how intermittent fasting may influence this? I was fasting a couple of days a week last winter. By spring my innards were in utter chaos. I can’t help thinking the fasting may have triggered the relapse/worsening. Thanks once again. I’m so confused! Keto diet, SCD diet, FODMAPS and lots of conflicting information. Its really hard to know what to do. I know that if I eat less I have less symptoms and that’s paramount to me. I’m tired of the bloating and water retention making me look ten pounds heavier than I am. I already have hashimotos and I know there is a connection between auto immune and SIBO. I’m currently considering moving home to Australia because they have a better approach of dealing with these issues there. Hi Soraya, it is VERY confusing! I think it becomes easier when you view these diets as just templates or maybe a starting off point. But it usually takes experimentation with different templates and making individual adjustments to find out what works best for you. Making sure that you are actively addressing the Hashimotos not focusing solely on SIBO could also be very important for you. Best of luck!! Great blog! I can really relate to everything you said. I have been unwell for over. Ayear now with digestive issue and every time I go strict carb and sugar restrictions my symptoms get A LOT worse. I just said to my husband tonight that I actually feel better when I’m eating healthy carbs. I’ve been on the fast track diet for 4 days and my symptoms have gone from maybe a 3 to a 9 since starting it. I was told this is die off effect and normal. But I feel absolutely horrid. No energy, de hydrated all the time no matter how much water I drink. Shakey, weak and emotional. It’s not agreeing with my body at all! I found this blood because I started researching the possibility of restrictive diets making symptoms worse. So glad I found it! Thanks for stopping by Christine and sharing your experience! Its great that you are trying to listen to your body to figure out what works best for you. Carbs definitely helpful for me…I feel like crap when I go too low. Keep adjusting and experimenting to see what works best for you! Thanks again for reading! Great article Amy! I highlighted the part about maintaining weight first, and the need to make up the calories with a lot more fats/protein than I’m used to. I’m halfway done with Rifaximin, and I haven’t had this much energy in years. It’s crazy, I have the ability to work until midnight and wake up at 7 am. That might sound normal to most people, but that’s unheard of for me. My normal state is constant grogginess, 20 years! This is the first time it’s more or less gone! I hope this lasts after the treatment. It would be life-changing if the productivity I’m seeing from just one week, will continue for months. As for carbs, it seems like granola and raisins are offenders for me that I’ll have to take off for now. Thanks for reading Jon!! Glad you found the article helpful. I think the sorbitol/fructose in the raisins can be problematic for some! I hope your son can find some relief soon Nancy!! I know it can be really hard to figure out how to treat SIBO. Did they figure out if the inflammation is caused be h. pylori? No H. Pylori. He probably got it from repeated constipation because he refused to go to the bathroom at his school (he said the bathrooms were disgusting). Oh no! I hope the bathrooms are at least a little better now and he can go at school! Thank you, but Omg. He hasn’t been to school in 1.5 years. He’s in constant pain and has brain fog so it’s impossible for him to think or concentrate on anything of substance. I read about adults missing work and it makes me wonder when this will all go away. Very well written, thank you! You’re absolutely right. Most of us live in food fear. I know I do! I’ts so difficult. Thanks for the kind words! It took me awhile to untangle my food fears, but I am doing so much better now! I am SO confused! I have been seeing a naturopath and functional medicine doctor and diagnosed with yeast and bacterial overgrowth in the gut. I am 6 weeks along taking anti-fungal and digestive enzymes. I have been gluten, dairy and sugar free but suffering from extreme bloating and fatigue. Wondering if I have SIBO too so I added activated charcoal, oil of oregano and a candida blend of garlic and ginger with meals. Any tips? I totally have food anxiety now and have gained weight over the last year. I feel pregnant at times and I am eating so clean. I don’t get it! I think it is from stress/anxiety as my job is very intense. I go to chiropractor, get massages and trying to find rest but it is difficult. Thoughts? Anyone else relate? The bloating is the main issue now as I feel pressure and worse at the end of the day or after I eat. Thanks for your wisdom in this article! Hello CoMama! I struggled a lot with finding finding a balance with all the stress of it all! Dealing with chronic health issues can be really tough and stressful to deal with. In my case, the stress of being too clean and perfect really negatively impacted my recovery. So the first tip is just give your self some wiggle room with diet and lifestyle stuff! Second tip is to make stress management a priority. You mentioned that it was difficult, but it is so important. Whether that’s a message, chiropractic or walking at night…daily stress relievers can really help. I love meditation personally. I typically do it 1-2 times daily. It improves my digestion and makes me so much calmer! Third tip is that testing for SIBO is so so important. I wouldn’t add anything in until you know for a fact that you have it! I hope these tips were helpful! I can so relate to the confusion and frustration associated with chronic digestive issues. This has been a most difficult health challenge, physically and emotionally. Numerous food intolerances; all the brassicas, eggs, nuts and seed, most legumes and all grains. Must avoid night shades ie, capsicums, eggplants, potatoes etc and if that wasn’t bad enough all foods with moderate to high oxalate levels, leafy greens, nuts and seeds that am not intolerant of. I literally have maybe 10 foods that I can eat. I have sought help everywhere; functional medicine, conventional MD, wholistic nutritionist, now working with a second naturopathic doctor who has me on the SIBO BiPhasic diet, it has settled most of the symptoms but is extremely restrictive and I have lost a tremendous amount of weight, which bothers me a lot, I was small to begin with. Any attempt to reintroduce starchy foods or even eggs results in unbearably bloating, very foul smelling gas and gurgling. I have had so many test and procedures done and everything has come back normal; even the SIBO tests, I did two. There are days when I feel like I am going CRAZY, I no longer go out except to work; and when I do am tired of people asking me why I have lost so much weight. This is most difficult because I had always looked after my health; I never ate processed food, in fact I was eating a complete plant based diet, never smoked or drink alcohol, no major life stressors and exercised but now for the last three years my life has been turned upside down and I can’t figure it out or make it better. But I must keep on going and hope and pray that it will get better one day. The most challenging aspect is the diet, it was extremely difficult to change the way I eat; from plant based to eating animal products, but I did in the hope of getting better but that still hasn’t work. Earlier when building medical nutrition it was assumed that it was always necessary to unload and spare (load gently) the diseased organ. This is the old way of diet therapy. Currently, diet therapy is taking a new form. It becomes apparent that long lasting, permanent sparing some functions of the sick body leads to very slow recovery and the results of treatment of unstable work. On the contrary, the constant or periodic training of the diseased organ quickly restores its functions and gives a more lasting effect. (it’s a translated fragment). Absolutely brilliant!! I wish I had come across your article 2 years ago! I am living proof of everything you mentioned: dysbiosis, severe weight loss, nutritional deficiencies, worsening of the thyroid function. Basically, after attending many SIBO webinars and trying so many things, I am worse than when I started! Atrantil worked wonders for me but unfortunately I have Hashimoto’s and the peppermint extract gave me Hashi symptoms. I did notice that I feel a lot better when I don’t restrict so many foods. Thank you so much for this very informative article! Thanks for a great article. I have a similar story and have lost too much weight from being afraid of feeding the Sibo! I now just want to heal my whole body and stop just focusing on the bad bugs! Do you know if there has been any success with using large amounts of raw fruit for carbs, and having no grains? I have started trying this and sometimes feel amazingly well, and other times feel worse than ever!! It feels like my body is detoxing a lifetime of bad habits, and on one hand, the Sibo is getting a good feed, but on the other hand my whole body is getting a healing, becoming stronger and my immunity is starting to kick in and help the cause. It’s only been a few weeks but heck, if raw foods can heal cancer surely it can help the body kick Sibo? I was diagnosed with IBS-C and SIBO-C (constipation versions) in 2016, after many years of low-carb dieting. I first heard that restricting carbs depletes the gut of mucin 2 from an article on the Perfect Health Diet site by Paul Jaminet. It of course bothered me to think that I’d brought this on myself in my quest for a bikini body. I switched to the PHD diet and treated the SIBO with Atrantil. That worked, but the bloating and constipation came back about 6 months later. I tried eliminating FODMAPs, AIP foods… eventually my diet was so restrictive that shopping and cooking all my own food was a burden, travel was stressful, and life was becoming not enjoyable. Having nothing to lose, I tried a 10-day water fast. It cured me. That was about six months ago, and I’m still “regular”.